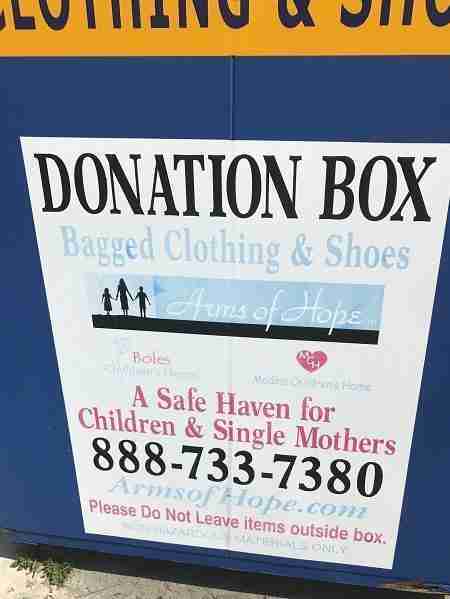 Christy Tinsley Ilfrey and her family were on their way to the beach, and wanted to first make a quick stop to drop off some unwanted clothes in a donation bin. Ilfrey opened the bin and was about to drop in the bags of clothes - when suddenly she heard desperate meowing coming from inside the bin. "I pulled the lever again and peered inside," Ilfrey told The Dodo. "There, scurrying along the metal floor, was a tiny gray kitten. He was panicking. I called to my daughter and husband who were still inside our car, and they joined me at the bin." The family immediately knew that they couldn't just leave the little kitten in the bin, suffering all alone, and so they began to try and come up with a plan to get him out of there. Ilfrey's husband called the company in charge of the bin, but since it was Sunday, he was unable to get in touch with them. 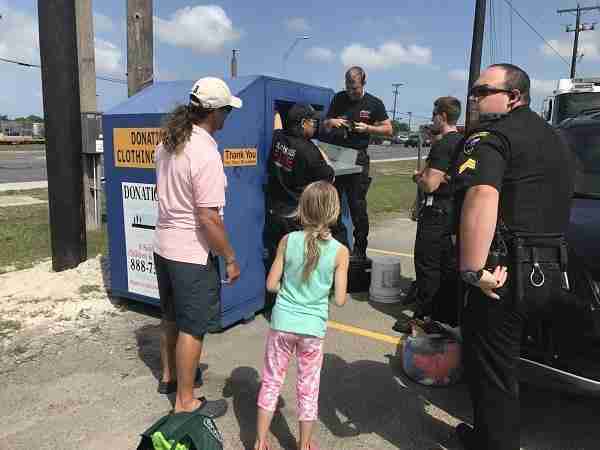 The couple's daughter, Sage, wanted her parents to lower her into the bin so she could pull the kitten out, but they were worried she might get stuck in there, too. The family soon realized that the quickest way to rescue the kitten would be to call the police for assistance. They called the Aransas Pass Police Department, which brought along the Aransas Pass Fire Department. Five firefighters worked to loosen and saw through the bolts on the donation bin, until finally, there was enough space to reach inside. "One firefighter then reached deep into the bin," Ilfrey said. 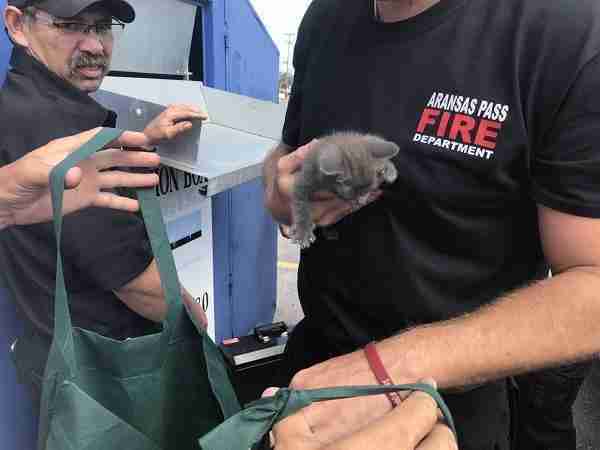 "A very tiny, very hungry gray furball emerged just as an officer from Aransas Pass Animal Control arrived. The entire rescue lasted less than thirty minutes." 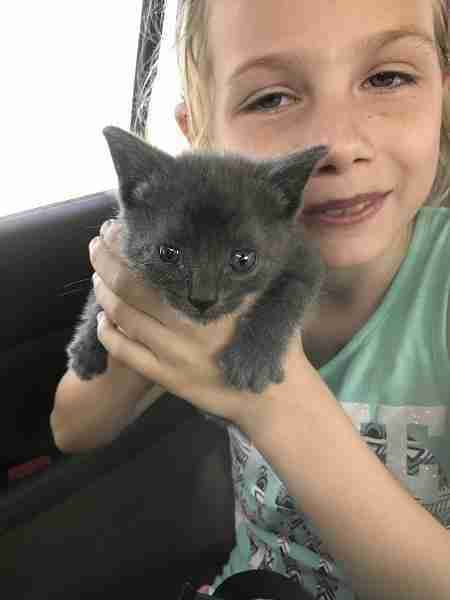 The family stayed and watched the entire rescue, and when the little kitten was finally pulled from the donation bin, they knew right away that they wanted to adopt him. "Sage and I had recently discussed getting a playmate for our cat, Lupine," Ilfrey said. "We live in a tiny home with three dogs and a cat, but we knew we could make room for this sweet little soul." On the way to the donation bin, the family had been listening to a band called Jones, and the officer who'd responded to their call was named Jones, too, and so Jones became the name of their new family member. 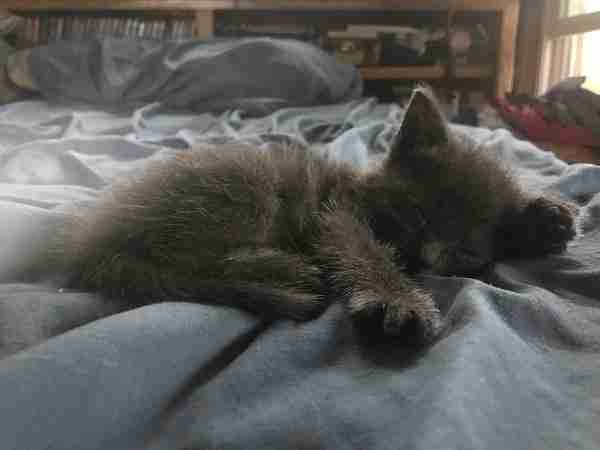 After taking Jones to get checked out by a vet, the family found out that he's around 4 weeks old and weighs just under 1 pound. He has a few minor medical issues that can be easily fixed, but otherwise, he's completely healthy and settling in wonderfully to his new home. "He loves all of his new siblings," Ilfrey said. "He is particularly fond of our dog Grover and snuggles next to him during naptime. He is definitely one brave and resilient little boy!"